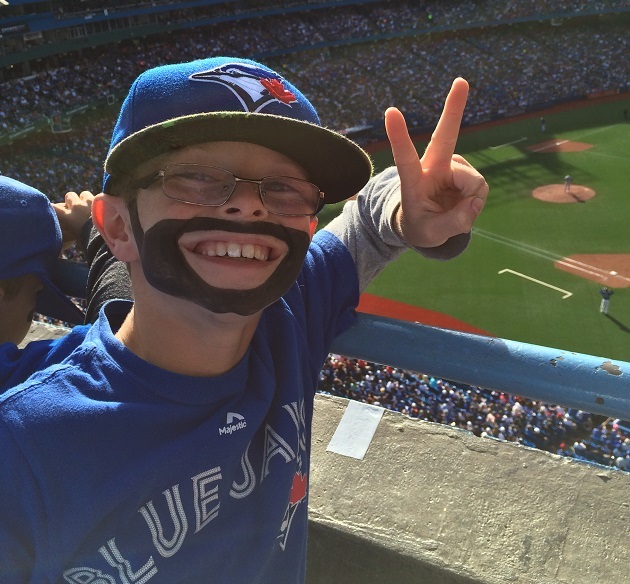 Meet Oscar Wood, the kid known as "Mini Jose Bautista" who called Bautista's game-winning shot on Wednesday. 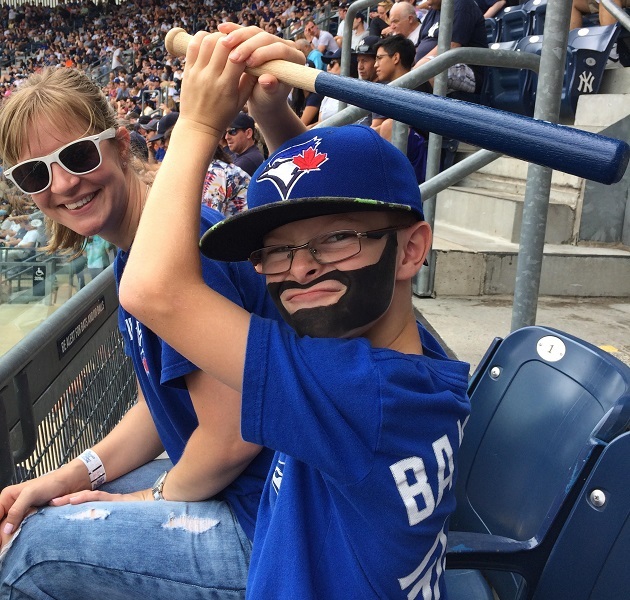 Moments before Toronto Blue Jays outfielder Jose Bautista hit an ALDS-winning three-run blast, a young fan at the Rogers Centre known as “Mini Bautista” called the shot. Oscar and his father, Benn, who took the video, took some time out of their celebrating on Thursday to chat. SI.com: Tell me a little about yourself. Do you play baseball? How long have you been a Jays fan? Oscar Wood: ​I’m nine years old, and I'm in Grade 4. I've been a Jays fan for three years. I do play baseball, I play in a league. We’ve been to a lot of Jays games this year, I can’t count. Benn Wood: I think it’s between 25 and 30 this year. SI.com: Benn, how long have you been a Jays fan? Benn:​ Five years. I had my five-year anniversary just the other day of the first Jays game I ever went to. It was against the Tampa Bay Rays, and I went with my neighbor because he had a ticket. I went wearing a Manchester United soccer jersey. It was a case of love at first sight. I just loved the atmosphere, and I thought ‘Wow, this is definitely somewhere I can bring the kids, definitely somewhere we can spend the day.’ We actually live an hour north of Toronto. I just kind of realized all those baseball movies I watched as a kid kind of planted the seed, and it sat there dormant waiting to kind of flourish. SI.com: Do you plan on going to any more this season? Benn: We’re hoping to get to the next series, as well. That's the plan. Home Game 2, which is Game 4 of the ALCS. SI.com: Is that a drawn-on beard? Does it leave a mark when you take it off? Oscar: It’s actually face paint. It doesn’t - it wipes clean off. Benn: It smudges around a bit from time to time. But, it comes off eventually. SI.com: Have you ever willed Jose Bautista to a home run before? Oscar: Yes. 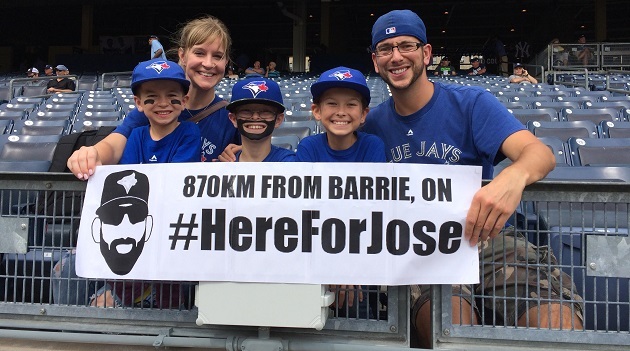 I did that at Yankee Stadium, and he hit a home run, and then we did it at the Jays-Rays game and he hit two home runs. SI.com: Why is Jose Bautista your favorite player? Oscar: ​Because he’s got a really great arm, he can throw long distances, and he’s a really big hitter. SI.com: Are you aware that people are upset that Jose Bautista flipped his bat? Benn: Exactly, buddy, it was awesome. SI.com: So you're not worried about your son seeing a batflip? Benn: ​We like the different styles of batflips as well. We like when they flip it around and the person nearly catches it again by the handle. Those are the cool ones. We call them windmills, or helicopter blades. Jose’s batflip was more like a rocket taking off, like NASA. I like how it went out of the camera shot.